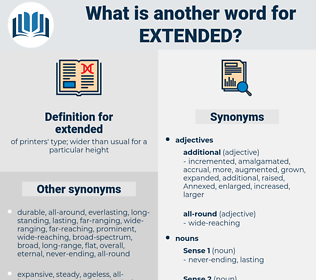 What is another word for extended? Extending, extension, Enlarging, wide-ranging, renewed, expansive, elongated, continued, Supplemented, prevalent, enhanced, widen, expand, extent, far-reaching, drawn-out, wide-area, stretched, vast, time-consuming, expanding, long-standing, augmented, protracted, long-lasting, longstanding, pervasive, extensive, wider, developed, scaling-up, exhaustive, long-drawn-out. Extending, dimensions, extension, extensions, extends, prolonged, enhanced, expand, extent, stretched, expanding, expands, augmented, protracted, extensive, wider. Tended, sent, lent, consolidated, suspended, congratulate, Congratulated, Indicated, express, expressed, expresses, implementation, intended, encompass, Encompassed, implement, implemented, demonstrated, Explained, invite, invited, thanks, Thanked, proportionate, Rendered, circulated, Tendered, intensified, Generated, escalated, included, Consisted, Introduced, Examined, initiated, appreciated, Issued, Contributed, tightened, reaffirmed, Perpetuated, enforcement, Testified, authorized, transmitted, Ranged, invested, suggested, facilitated, re-affirmed, reinforced, involved, advances, Consented, noted, forwards, Forwarded, conducted, conferred, reactivated, hailed, presented, Persisted, dispatched, Attributed, reported, upgraded, rescheduled, accordance, Manifested, encouraged, Prosecuted, declared, holders, Punctuated, lay, lying, spans, Petitioned, altered, handed, approved, withheld, permeated, opened, concerned, reprofiled, imposed, tied, Reached, confirmed, Began, Wrote, directed, Scales, Submitted, formulated, centered, considered, reflected, Obtained, welcomed, advised, Operated, supported, address, addressed, Was, Were, appointed, applied, offer, Offered, centred, announced, Adjourned, repeated, Grew, Complained, designed, re-elected, received, covered, Referred, Entered, GONNA, Enabled, Proceeded, location, ready, Volunteered, informed, produced, set, committed, turned, decided, Evolved, Resumed, Listened, Lodged, Resulted, allotted, Devised, permitted, revived, rejected, Created, used, Adduced, Lasted, voiced, Arrived, contacted, drove, pursued, to, stressed, agreed, Followed, led, Discussed, shut, Managed, Pushed, drew, Wished, changed, also, Filed, da, shared, hosted, Challenged, touched, touches, sought, advocacy, Borrowed, relayed, ordered, rolled, attached, Served, tabled, swept, Wore, Steered, accused, Embarked, reserved, Gave, prepared, proved, Assessed, Leveled, Levelled, Upheld, Urged, Hoped, said, Stayed, Carried, assure, Supplied, van, Appealed, started, bring, Brought, placed, paved, Performed, Helped, Caused, Took, Aimed, headed, Asked, go, Went, rose, laid, 'd, requested, wanted, Rated, Allowed, Launched, Met, Passed, Had, put, charged, paid, Bought, bore, played, Approached, Looked, faced, Dealt, stated, come, Came, Accorded, accords, Ran, Talked, booked, up, focused, focussed, Got, award, Awarded, awards, called, tried, Shipped, Did, Chaired, kept, made, 'il, continued, Supplemented, enhanced, stretched, augmented, protracted, developed. Tended, expended, sent, incorporated, lent, consolidated, suspended, Exceeded, exacerbated, Indicated, Disseminated, Excluded, Exerted, expressed, donated, amended, Explored, intended, extrapolated, discontinued, deepened, implemented, attended, reappointed, demonstrated, spent, understood, acknowledged, Transferred, invited, Exempted, Thanked, mainstreamed, Administered, Exhibited, guaranteed, integrated, Rendered, Investigated, distributed, complemented, circulated, examples, transposed, Tendered, identified, intensified, Eliminated, Benefited, cancelled, designated, divided, Generated, limited, restricted, escalated, allocated, included, Enjoyed, Introduced, conveyed, Examined, conceded, initiated, appreciated, Undertaken, Exercised, streamlined, Issued, Contributed, repudiated, tightened, dedicated, reaffirmed, utilized, affected, contained, Delivered, Hindered, Cooperated, reduced, authorized, defined, Enacted, nominated, transmitted, determined, Comprised, Ranged, invested, suggested, facilitated, Replicated, reinforced, finalized, involved, Disbursed, Popularized, Consented, noted, expected, destined, Forwarded, conducted, devoted, Instituted, outdated, entitled, experienced, conferred, Invoked, anticipated, presented, report, authorised, softened, dispatched, found, Caught, Attributed, reported, upgraded, credited, rescheduled, Manifested, Bolstered, pledged, encouraged, Endured, proposed, Prosecuted, acquired, declared, bestowed, loosened, recorded, removed, enforced, Liberalized, multiply, altered, retained, attained, approved, prohibited, broadcast, Remitted, Amplified, Begun, written, sidelined, opened, concerned, reprofiled, imposed, refurbished, scaled, deprived, organised, Reached, Displaced, Communicated, Inflicted, funded, directed, adapted, defeated, Surpassed, Submitted, admitted, Prorogued, Been, formulated, centered, considered, reflected, Obtained, recognised, welcomed, Promoted, arranged, applies, Operated, supported, Waived, addressed, compounded, organized, appointed, finished, magnified, delivery, relaxed, applied, grown, assigned, Offered, Progressed, adjusted, centred, ignored, Adjourned, Rebutted, engaged, repeated, isolated, adopted, located, Channelled, designed, re-elected, Undergone, received, proceed, Returned, Targeted, covered, accomplished, Referred, Cited, Entered, GONNA, pressed, insured, accepted, Boosted, situated, Convened, dismissed, revised, modified, vested, produced, set, Provided, accompanied, committed, entrusted, Forgiven, turned, decided, Evolved, Resumed, furnished, simplified, Incurred, moved, Achieved, reconvened, recognized, Lodged, handled, prescribed, Resulted, allotted, Devised, template, permitted, driven, rejected, Compared, Created, opposed, Voted, Repealed, used, warranted, Worked, Adduced, Lasted, voiced, overwhelmed, Arrived, discharged, contacted, cast, HIT, established, pursued, Ascribed, implied, ensured, guided, foreseen, Subjected, thwarted, Earmarked, scheduled, stressed, effected, agreed, struck, Recruited, Quoted, Yielded, Followed, drawn, embedded, led, Discussed, sponsored, practised, Managed, preserved, shot, Attracted, Pushed, expanded, equal, changed, Filed, shared, hosted, tailored, Emitted, studied, left, realized, taught, Stepped, protected, Touted, Meant, Rebuffed, observed, thrown, touched, sought, Notified, Borrowed, Occurred, employed, Displayed, filled, inclined, secured, spoken, worn, ordered, rolled, perceived, Towards, treated, Escorted, held, Loaned, attached, Served, tabled, sworn, Remained, processed, given, reformed, proven, discarded, accused, built, Embarked, reserved, required, prepared, proved, Assessed, assisted, assured, Levelled, Upheld, Urged, Repulsed, Arisen, Raged, Stayed, replaced, known, Happened, Carried, Supplied, Appealed, started, Brought, seen, linked, Shown, raised, placed, Argued, access, accessed, reviewed, paved, taken, Gained, imported, mailed, Complied, gone, Performed, Helped, Afforded, Caused, Aimed, become, headed, posted, felt, Shifted, revamped, Asked, risen, released, hired, Repelled, suited, laid, planned, Prompted, requested, have, Allowed, Launched, Met, Passed, born, Borne, Had, put, zoomed, charged, paid, eased, aired, played, geared, Approached, Looked, busted, heard, Dealt, stated, come, run, Accorded, booked, focused, focussed, Got, Awarded, called, done, Shipped, kept, based, named, made, renewed, prolonged, elongated, continued, Supplemented, enhanced, stretched, augmented, protracted, developed. amended, deepened, allocated, conveyed, deliver, Delivered, Granting, Grants, maintained, application, Provided, expanded, Loaned, spoke, built, raised, extension, renewed, prolonged, expand. Curtailed, condensed, abbreviated, compressed, cut, lessened, shortened, contracted, reduced, narrow, abridged. smallish, undersized, short-lived, limited, puny, abrupt, curt, mini, shortish, ephemeral, miniature, diminutive, sudden, transitory, fleeting, tiny, restricted, wee, nonfigurative, diminished, momentary, minute, circumscribed, short-range, teeny, bitty, transient. Mrs. Morton, with trembling fingers, extended a half sheet of note - paper toward the detective. The end still extended to the Choma, whence it had started. extend, extend to, eighth note, excitant, East India, esteemed, existent, extent, executant, estaminet, eighteenth, extant, east wind, extenuate, estimate, exodontia, excitement.